I started baking cakes whilst standing on the kitchen chair at my mother's side more than 25 years ago. She always let me put my fingers around the bowl at the end, and I have never forgotten the joy of the wonderful smell of baking cakes and of course being able to eat them afterwards! Today the passion remains. While learning my craft my husband's colleagues were very happy to take my junior creations off my hands and as the years passed he would come home with an order from time to time. As the mother of two young children, baking occasion cakes at home in Oxford means that I have not needed to return to office work and can follow my dream. I now make cakes to order. I create personal cakes which mean something to the lucky recipient. I like to talk to clients and understand their specific interests or hobbies and then suggest designs for a cake or cupcakes relevant to the event being celebrated. I especially love making wedding cakes and cupcake bouquets. I have completed the 'City & Guilds' Food Safety and Hygiene Level 2 Certificate, I am registered with Oxford City Council with a 5 STAR Hygiene rating and I am fully insured. I have a state of the art kitchen in my own home and can create all kinds of stunning cakes. 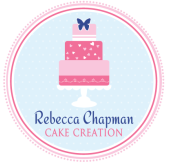 I run regular giveaways on my Facebook page so please 'like' Rebecca Chapman Cake Creation. Give me a call and we can discuss what you might be tempted by. I can deliver at a time to suit you and at a price that may surprise you.